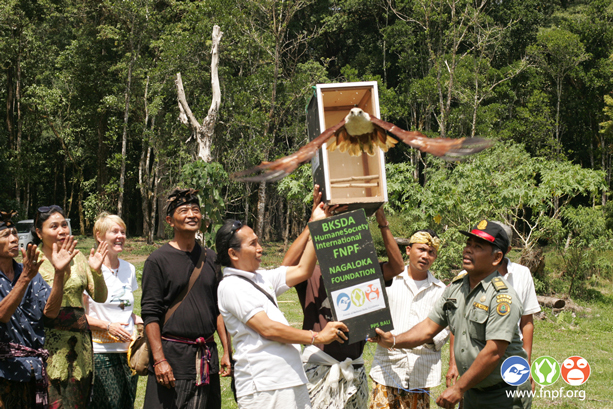 “I am very pleased that the Hawk-eagle release was successful,” says Friends of the National Parks Foundation (FNPF) Founder and CEO, Wirayudha Bayu Dr, who works closely with wildlife rangers from Department of Forestry’s Natural Resources Conservation Agency to rehabilitate poached birds back to native forests. Kite brahminy (Haliastur indus) populations are declining and in Indonesia, while not endangered, the birds of prey are vulnerable to poaching and smuggling, as well as rapid habitat loss. Another smuggled Changeable hawk-eagle is in rehabilitation preparing for wild release at Bali Wildlife Sanctuary, Besikulung, in Tabanan region, sur 10 September – after being confiscated from illegal wildlife poachers by the Department of Forestry’s Natural Resources Conservation Agency.